Microbe-Lift Pond Bacterial Balancer contains naturally occurring, non-toxic microorganisms. It is safe for the environment, humans, lakes, rivers, pets and all filter systems. 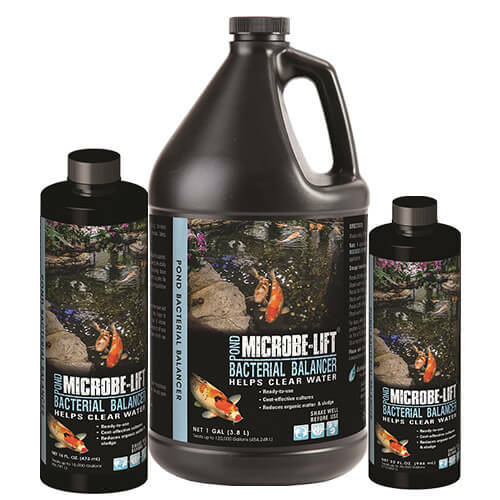 Microbe-Lift Pond Bacterial Balancer is a spore-based blend of Bacillus species. These aerobic heterotraphs (organic degraders) provide the ability to quickly establish populations necessary for breaking down organic waste from fish, waterfowl, plants and other aquatic life in your pond and aid in quickly establishing a functional population in your pond's filter. As a result, Microbe-Lift Pond Bacterial Balancer helps to keep water clean and control build-up of sludge or bottom solids. It also helps to establish denitrification- the biological conversion of nitrate to nitrogen gas- which bubbles harmlessly out of your pond, reducing the availability of soluble nitrogen which can stimulate unwanted growth in your pond. 20-50 2 oz. 1 oz. 51-200 3 oz. 1.5 oz. 201-500 4 oz. 2 oz. 501-2,000 6 oz. 4 oz. 2,001-5,000 8 oz. 5 oz. 5,001-10,000 16 oz. 10 oz. 10,001-15,000 24 oz. 15 oz. 15,001-20,000 32 oz. 20 oz. 20,001-25,000 40 oz. 25 oz.